The Dominican sisters singing a waiata after Communion. 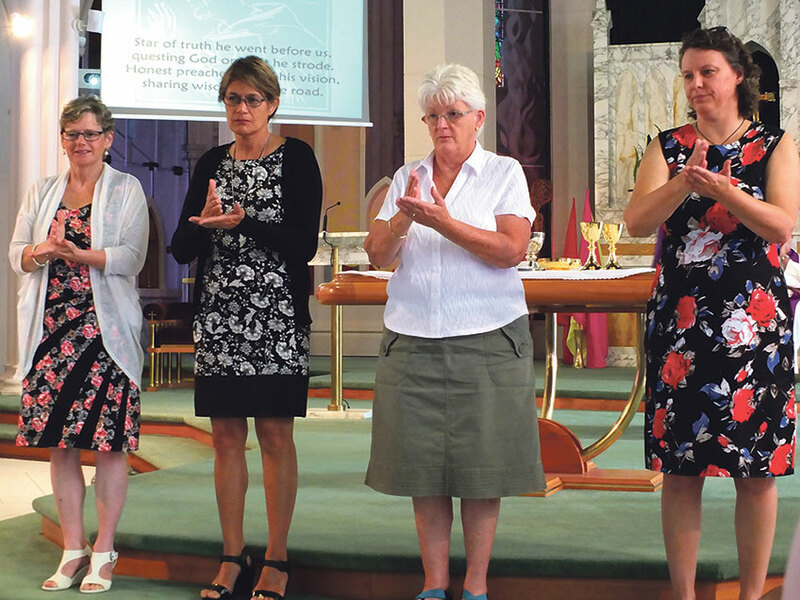 Seventy-five years after the Dominican Sisters first began their involvement with the Deaf Community in Wellington, members of the Palmerston North Diocese fare-welled the Dominican Sisters from their diocese at a gathering on Sunday 18 February. 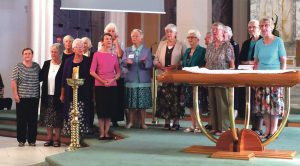 The Sisters’ 75 years of commitment to a specialised ministry in the Church is a significant contribution and worthy of suitable recognition by the Bishops and the Church locally and nationally. 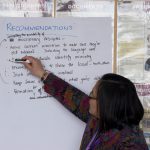 The wonderful turnout in Palmerston North was a well-deserved tribute to the Sisters’ dedicated work with the Catholic Deaf community in New Zealand. Celebrations started in a packed Cathedral of the Holy Spirit for the 9.30am Mass, celebrated by Bishop Charles Drennan. He was assisted by Bishops Peter Cullinane and Owen Dolan, Msgr Brian Walsh, and Frs Peter Fahy and Marcus Francis. Six Deaf flag bearers led in the procession and the entire Liturgy was Signed by members of the local Deaf Community. At the Offertory, the Dominican song, Sing of Dominic Joyful Friar, was Signed by the Deaf Choir. 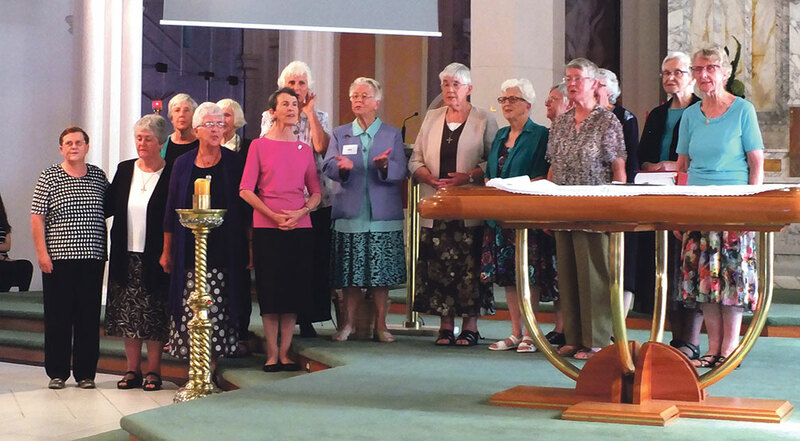 After Communion Sr Elizabeth Mackie op spoke on behalf of the Dominican Sisters, followed by 15 Sisters gathering at the sanctuary to sing a beautiful waiata. 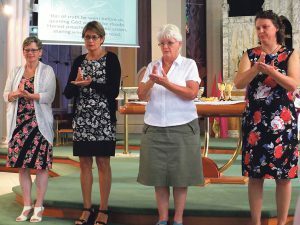 After Mass, people gathered outside the Deaf Chaplaincy Centre – renamed St Dominic’s Catholic Deaf Centre – for the blessing of a new sign by Bishop Charles. Lunch followed, with speeches given on behalf of many groups the Dominican Sisters have influenced in their years of service to the diocese. 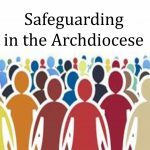 A card was presented to Sr Maureen O’Hanlon op in recognition of her 45 years’ service to the Catholic Deaf community through education and ministry. 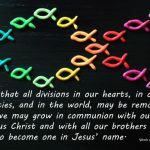 David Loving-Molloy is the Deaf Chaplain for the Palmerston North Diocese.